260 High performance street profile. This is a Hardweld cam and requires a core. Cores are not always available through Dynoman for this engine, and the camshaft may have to be built on your core. Hardweld cams require 1 to 4 weeks production time. 270° Hot street, cafe racer. 280° Drag strip, road race. Requires High Compression Pistons, and Racing Valve Spring Kit. Core charge will be refunded if usable core is received at WebCam U.S.A. within 60 days of purchase. Please contact us for details on shipping your core. Hardwelded and precision ground making your worn out or new rockers contact point into a longer wearing surface. Recommended with ALL cam profiles. Only available on an exchange basis (cores required, see below). Core charge will be refunded when usable cores are received at WebCam U.S.A. within 60 days of purchase. Please contact us for details on shipping your cores. Do your rocker arms look like this? Cam Card This cam is designed for use with our DP592/61r race pistons! Clearances must be carefully checked with this high output cam! Powerband from 6500 to 11,500 rpm with ported head. Checked at ZERO valve lash. Racing Valve Springs required. Adjustable Cam Sprocket recommended. These are Hardweld cams and require a core. * Core Fee is refundable if usable cores are returned to WebCam within 60 days. Please contact us for complete instructions. 280° dur High performance street profile. When using factory pistons, check clearances carefully. 288° dur Hot street, cafe racer. Requires high compression pistons and racing valve springs. Timing Card . Adjustable Cam Sprocket recommended. These are Hardweld cams and require a core. Cores are not always available through Dynoman for this engine, and the camshaft may have to be built on your core. Hardweld cams require 1 to 4 weeks production time. Our DP cams are the original RC Engineering & Kenny Harmon grinds made for us by WebCam that we have used since the early '70s. We own the masters and WebCam makes them for us here in the U.S.A. from the highest quality American-made billets available! * Cam Specifications may vary from year to year in the RC Engineering catalogs. These cams were made for RC by different manufacturers through the years, and measurements were taken at various valve lifts (.040 .050 .100, etc). Specs shown below are for our DP cams. This cam makes excellent low to mid-range power and torque and top end as well. We have many customers that like them for the street, drag racing, and even with sidecar set-ups. Requires high performance pistons and valve springs. Available in either billet or hardweld (core required for HW). *Please check clearance with this cam, cam cut may be required. 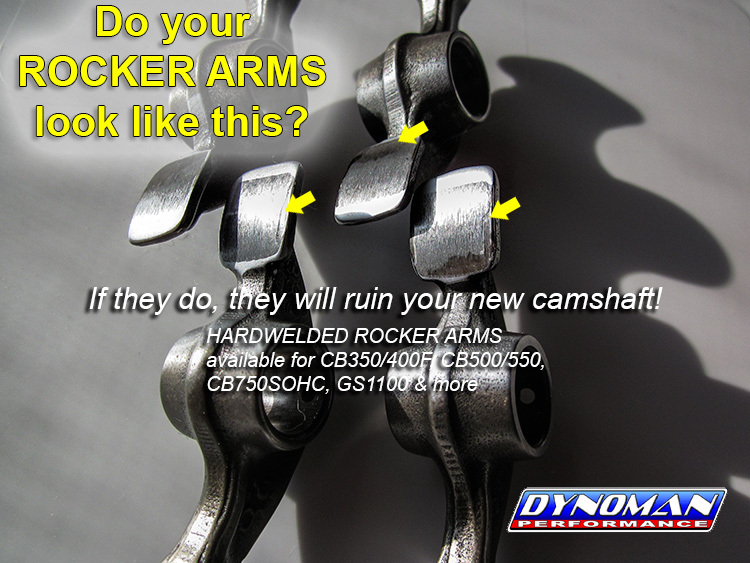 Dynoman also recommends Degreeing your new camshaft with our adjustable Cam Sprocket. Degree Wheels are available for just $25 with cam purchase. * Core required for hardweld cams. Core Fee is refundable if usable core is returned to WebCam within 60 days. Please contact us for complete instructions. Cores are not always available through Dynoman for this engine, and the camshaft may have to be built on your core. 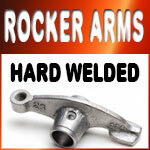 Hardweld cams require 1 to 4 weeks production time. Broad power range for street or touring. Bolts in to stock engines. Racing valve springs highly recommended with this cam. *For 1977-78 CB750F2 please check valve clearances carefully. 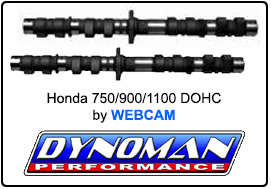 This cam works well in the F2 with our 836cc and 915cc piston kits. Titanium retainers are also a great addition. Degree Wheels are available for just $25 with cam purchase. Strong torque curve from the ground up. Comes on low and never quits. Great for heavy street and altered race bikes. A favorite for Street classes. Very tractable with fair idle and quiet operation. Requires high performance pistons. Works very well with JE 836cc piston kits. Ideal for our DP890 and DP915 Piston Kits. Also a good choice for our DP1000r Piston Kits. Must use racing valve springs and titanium retainers with this cam! Dynoman also recommends Degreeing your new camshaft with our adjustable Cam Sprocket. Degree Wheels are available for just $25 with cam purchase. Hot street cam. Requires Performance Exhaust System, High Compression Piston, and Performance Valve Spring Kit. Strong mid and upper end performance for street / strip. Requires Performance Exhaust System, High Compression Piston / Big Bore, and Performance Valve Spring Kit. Check ALL clearances! Excellent upper end performance. Requires Performance Exhaust System, High Compression Piston / Big Bore, and Performance Valve Spring Kit. CORE CHARGE INFO All Hardweld cams require either a usable core or payment of a core charge. Your Core Charge will be refunded to you if a usable core is received at WebCam within 60 days from date of purchase. Please email us for core return instructions. Please don't ship your core to Dynoman! Thanks! 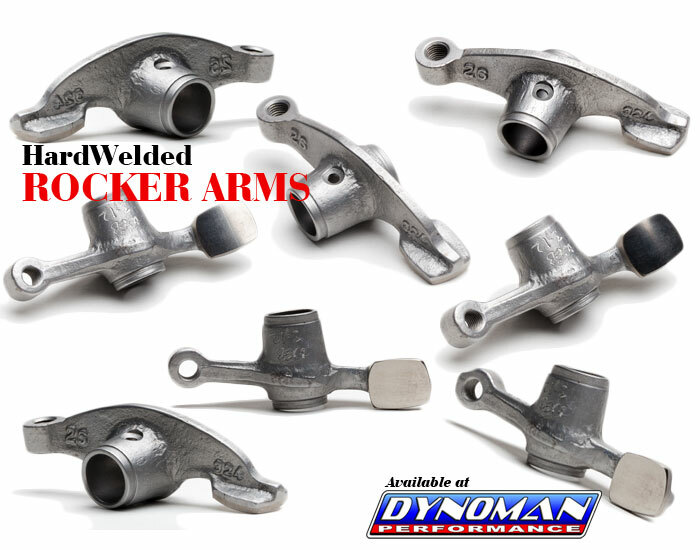 Are your rocker arms worn like this? Hardwelded and precision ground from original equipment cores. Much more durable and longer lasting than o.e. flash chrome rocker arms. Recommended for use with all cam profiles, both billet and hardweld. Core charge will be refunded to you when usable cores are received at WebCam within 60 days from date of purchase. Please email us for core return instructions. Great for open road street, cafe racers, touring, and other sustained medium and higher speed use. Good idle and tractability. Very user-friendly cam for street riders. Works well in all year models 1969-78 F&K! We recommend using Racing Valve Springs with this cam, and our DP Titanium Retainers are also a great addition! Degree Wheels are available for just $25 with cam purchase. #341 Broad power range for street or touring. Great for use with our DP836/65f2 and DP915/68f2 custom piston kits! 268° dur Bolt in performance profile for stock engines. Hardweld, requires cores. dur Road race profile. Requires high compression pistons, and racing valve springs. Hardweld, requires cores. High performance street grind for stock or lightly modified engines. Very broad power band. Performance valve springs required. OE 'stock' retainers and shim-on-top followers ok. Please email us for information if installing these in a 1979-80 CB750. These are Hardweld cams and require cores. Cams are usually IN STOCK and ready to ship! Pay $200 core fee and get them without waiting for hardweld! Core fee is fully refundable if usable cores are returned to WebCam within 60 days. Strong mid and upper end power for racing engines. Must use performance valve springs , high compression pistons, high flow exhaust system, retainers, and shim under style followers - available separately. 286° Good mid range and top end power for hot street or racing. Must use performance valve springs, available separately. Duration 270/270° Increases overall power throughout the RPM range. Shim on top OK. Requires Performance Valve Spring Kit. Check ALL clearances! Price Per Set (4). 284° Strong mid and upper end power for racing engines. Must use performance valve springs and shim under style followers. parasitic drag (free turning), and they last much longer. the core fee is usually $100 to $150 per cam. on shipping it to Webcam.